Andrew Kolberg, alternate delegate for the Wisconsin Republicans, says he is a Ron Paul supporter because the Texas Congressman&apos;s voting record is the “most conservative” among Presidential candidates. However the electrical engineer from Madison says his vote is bound to John McCain due to the delegation&apos;s popular vote system. He spoke to me at Ron Paul&apos;s Rally for the Republic. 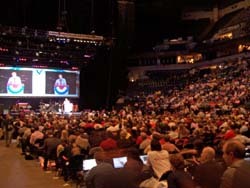 An non-RNC affiliated event which drew thousands in Minneapolis. The crowd and exhibits included people who want limited government, those who back the gold standard and 9/11 truthers. One exhibitor was pushing literature that claimed the world is rules by shape shifting reptiles. Kolberg admits there are some “oddballs” among Paul supports but he says you&apos;ll find some oddballs everywhere. He says the Republican Presidential Candidate unites all colors, creeds and political parties because everyone wants freedom.